Do you struggle to find your wrapping paper, ribbons, tissue paper, gift bags, tape, and scissors every single time you want to wrap a package? If you don't keep everything together it can take just as long to find all the materials and get ready as to actually wrap the present. In addition, some gift wrapping paper is used year round, such as for birthdays and other special events, but generally holiday paper is used only at one time of the year, and it can be difficult to put your finger on it in the big pile of Christmas stuff if you aren't careful. This gift wrap organizer solves both of these problems for you. 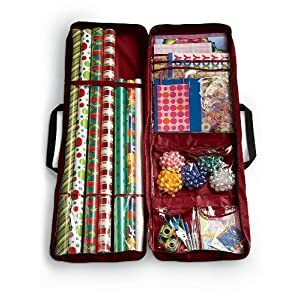 Many people actually get two of these organizers, one for everyday wrapping and one for their Christmas wrapping. When you aren't using your gift wrap all the supplies are contained in a neat little carrying case which you can stash in the closet or under the bed. Then, when you need to wrap something just grab the whole container and carry it to a large area to have space to do your actual wrapping, and you're done quickly and easily, without needing to hunt for anything. 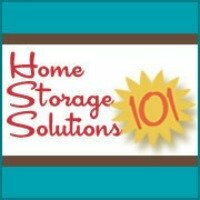 You can see even more recommendations and ideas for home organization products. Join in and write your own page! It's easy to do. How? Simply click here to return to home organization products.